The Aliante Spazio is a small freestanding loudspeaker with the bass-reflex port on the baffle. They are quite small (35H x 20L x 25P in cm. ), and pretty, with a nice real walnut finish (see picture above), very similar to the bigger Iperspazio but, thanks to the smaller size, even more elegant and classy. They are equipped with a 13 cm (5") woofer and a 26 mm (1") tweeter, and the same bi-wiring binding posts as in the Iperspazio. These binding posts are quite difficult to use being too near one to the other but it is also true that in *real life* a *real* audiophile should connect the speakers cables just once. For more infos on the Spazio's (tech infos and stuff) you should visit their WWW site. List price of these beauties, here in Italy is below 800 US $. Add import taxes, shipping costs, VAT's etc and the price in your Country may be higher. As we usually say: your mileage may vary. After some break-in (Aliante recommennds 30 hours at least) these Italian babies are ready to sing. Luckily the ones I got for the listening test were already broken-in so that I can enjoy their voice without any tedious delay. If you have read the listening test of the bigger sisters IperSpazio you could think the Spazio, being smaller and cheaper, sounds more or less the same but with less bass extension and punch. The Spazio is a totally different project, in fact not only these loudspeakers are smaller with a 13 cm woofer instead of the 17 cm that equipped the IperSpazio but even the tweeter is entirely different. The Spazio is sweeter and warmer than the IperSpazio which was a pretty analytical and precise loudspeaker, with plenty of detail and focus. So the perfect match with the rest of the HiFi chain was sometimes critical. Not so the Spazio, and with reason. Actually the Spazio is a cheaper project so it should work well with every kind of HiFi chain, even with the most budget-oriented one. The Spazio is coherent and it is very hard to tell where the tweeter crosses the woofer, which means that the crossover network is well-designed and made (actually it uses hi-end grade caps and coils, not to mention some Monster Cable internal wiring, pretty unusual for a budget design like this one). At a *first glance* (with the ear :-)) you won't be impressed by the Spazio but try to listen to it for 5 hours (non-stop) and you'll understand why these loudspeakers are so well considered here in Italy: your ear will never tell you to turn off the system or to lower the volume. A sweet treble (yet well extended), a clean and natural midrange and an outstandingly powerful and extended bass are the main qualities of this Italian loudspeaker. It is not as detailed as the IperSpazio but it is still very realistic. In other words: while the IperSpazio reveals every tiny piece of information of the musical program, the Spazio focuses your attention on the Music itself, though the details are still there. A big thumbs up for the bass range that helps a lot to bring you the juice of Music. Not exactly fast but well extended, powerful and articulated. The kind of bass you wouldn't expect from a small freestander with a 5" woofer. So the difference with the larger IperSpazio is LESS than expected, with respect to the bass range. Clearly the Iper goes deeper with a higher lever of musicality but its bass range is more for the expert audiophile than for the novice. The bass range of the Spazio is very impressive, indeed, though it still remains correct, never boomy nor over-inflated like in most of the budget small loudspeakers. So while the Iper is well suited for a hi-end oriented audiophile the Spazio is more enjoyable even by the novice who likes to listen to his fav Music without any hysteria, for hours and hours, seven days a week. 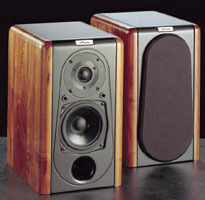 This loudspeaker has a really clever tonal balance: it is not a smaller IperSpazio, it is a whole different project. To say it in few words: less detailed in the highs but more convincing in the bass. With respect to this important parameter the Spazio has nothing to envy to its bigger sister. Never aggressive, even when played at loud levels the Spazio is able to reproduce a good sense of pace, though it can't be described as a fast loudspeaker. Like the Iper it doesn't like to impress with heart-shaking attacks and decays, it gets the job done with class and musicality which are rare for this given size and price range. It reminds some big floorstander which seems sometimes lazy and slow, with plenty of bass and extension. From a small freestander with a small woofer one could expect sharp attacks and faster-than-light decays but the Spazio isn't that kind of loudspeaker: it prefers to analyse the musical program, de-compose it and then offer it to you as naturally as possible...please remember than REAL musical instruments do have fast attacks but even slow decays, those loudspeakers that transform a REAL instrument in a electronic one (artificially fast attacks and decays) aren't doing a good job to your Music. The Spazio can sound loud, very loud. It feels at home inside small listening rooms but it is able to sound good even inside larger living rooms (I have a large living room for the reference system and a smaller one for budget/small components). This lovely Italian beauty, as the bigger Iperspazio, can create an incredibly large and realistic soundstage, virtually disapperaring from your sight as the Music begins. This was one the big pluses of the IpeSpazio and still is for the little Spazio. The guys at Aliante know how to reproduce a realistic soundstage. This is probably due to the choice of the speakers and also to the precision of the components of the crossover, once again responsible for the good performance of this loudspeaker. The soundstage is large and deep, mostly behind the loudspeakers with a precise distinction of every virtual plane. Not as precise and focused like the one created by the Iperspazio but still amazingly real. The center of the scene never fluctuates, thanks to the stiff and non-resonant cabinet and it becomes even deeper if you install the small felt quarter-of-a-circle rings that come with the Spazio. These felt rings should be placed at the left of the right tweeter and at the right of the left one. This is a very old tweak that makes wonders with almost every tweeter and it is a pleasure to see that the Manufacturer includes these felt gizmos in the package. 60/65 cm stands are a must to get the best out of these loudspeakers. They work better with stiff and light stands with spikes between the stand and the floor at least. Between the cabinet and the stand the spikes aren't necessary though some blue-tac could improve the precision and the focus of the scene. The biwiring improves the overall performance but it is isn't strictly necessary. Sometimes, especially with budget-conscious speakers, it is better to use a single cable of higher quality instead of two cables of lower quality (Monsieur Lapalisse, are you listening me? :-)). These loudspeakers are quite easy to drive so you don't need to spend outrageous amounts of money for the amplifier. Even a NAD or Rotel amp can get the job done. Of course an Audio Analogue Puccini SE (and similar) can make these speakers sing better but it's mainly a matter of the budget you want to spend for your HiFi chain. A very pleasant loudspeaker, a clever design devoted to play Music for hours and hours, even at loud levels, always with a sense of grace and respect for your ears. Not well suited for razor-sharp sound fanatics but definitely enjoyable by Music lovers. Wide imaging, good bass and a sweet mid-to-high range are the major pluses of the Spazio. If you're in the market for hyper-detailed and precise loudspeakers please don't consider these Italian beauties. But if like listening to Music for hours then these speakers are for you.